The influential oil and gas executive advising US presidential candidate Marco Rubio has for years used his political clout to lobby against tougher rules across shale country. Last month the Florida Senator, darling of the Republican establishment, drafted Larry Nichols, the founder and former CEO of fracking firm Devon Energy, to shape his campaign’s energy policy. Reports in the US press claim Devon spent hundreds of thousands of dollars in order to overturn a Texas town’s decision to ban fracking, and used its political connections to resist calls for emissions and wastewater regulations in Oklahoma. With an estimated enterprise value of $32 billion, the Oklahoma-based Devon Energy is one of the largest independent oil and gas producers in the US. Nichols is credited with the company’s rise into the Fortune 500, having founded the firm with his father in the 1970s and spotted the opportunity posed by hydraulic fracturing in the 1990s. Since then Nichols has become one of the most politically active oil execs in the country, serving as chairman for the American Petroleum Institute and directing the American Natural Gas Alliance. He’s also a member of the political donor network established by the infamous Koch brothers. Before he joined Team Rubio, Nichols gave $5,0000 to Wisconsin Governor Scott Walker for his 2012 recall vote, and oversaw a $50,000 donation from Devon to the Wisconsin branch of the anti-tax Super PAC Club for Growth — which was supporting Walker. In this election cycle, he’s so far given $50,000 to Conservative Solutions, the PAC backing Rubio. Meanwhile, according to Open Secrets data, Devon has spent more than $16 million on lobbying since 1998 — recently it’s been spending around $2 million a year. Let’s start in Nichols’ home-state, where Devon is especially powerful. In perhaps the firm’s most egregious use of political pressure, Devon was revealed by the New York Times to have leaned on Oklahoma Attorney General Scott Pruitt to write to the Environmental Protection Agency (EPA) in defense of the oil and gas sector. Pruitt told the EPA that federal regulators were massively overestimating the amount of air pollution caused by natural gas extraction in his state, but the three-page letter he sent was actually written by Devon’s lawyers and given to him by Devon’s lobbying chief. A senior exec at Devon is reported as saying: “The timing of the letter is great, given our meeting this Friday with both EPA and the White House”. Following the NYT investigation, Nichols was defiant. In conversation with the Tulsa World newspaper, he said: “Our industry thought their study was deeply flawed from the methodology. Devon hasn’t just used its influence to criticize what it regards as flawed pollution studies, but also seismic research the firm considers groundless. Oklahoma has been hit with an unprecedented wave of earthquakes in recent years, a development that has been widely attributed to fracking operations in the state — specifically wastewater injections into deep underground wells. Back in 2011, after both Arkansas and Ohio took actions to curb the practice, Oklahoma faced calls for tougher fracking regulations — but that didn’t happen. An investigation by EnergyWire showed just how powerful Devon was in its home state, where its talking points were used by the fossil fuel funded Governor Mary Fallin to reject the link between increasing fracking activity and increased seismic activity. The Governor’s office had turned to Devon for help in responding to a series of earthquakes near Oklahoma City. In the wake of that incident Nichols sought to dispel any connection to oil and gas extraction. But Devon’s presence is felt well beyond even the Governor’s mansion — all the way into the labs of the Oklahoma Geological Survey (OGS). First there’s funding. Devon, who bought the OGS a new core viewing room in 2014, is one of a number of oil and gas companies spending to support the scientific organisation. Larry Grillott, Dean of the University of Oklahoma’s Mewbourne College of Earth and Energy, said of the OGS: “We do get a lot of support from the energy industry”. Second there’s the revolving door. Just a cursory look at the ties between the OGS and Devon turned up a geologist who went from Devon to the OGS and back to Devon over the course of a few years. And just for the record: The OGS continued to recommend further studies into the state’s quakes and refused to issue any report on the link to oil and gas drilling until years later. Devon is also a major player in Texas, where it is the largest leaser in the Barnett Shale. Where it has been especially involved is Denton, the town that voted to ban fracking in 2014. Ultimately that ban was overturned by the Texas legislature, with Devon spending nearly $200,000 in a PR and lobbying blitz. The group Devon donated to argued the ban would hurt the town’s economy. Remember Oklahoma Governor Fallin? Well she signed a similar bill which prevents local governments from banning fracking. It’s worth noting that, through all this, Denton’s congressional representative Myra Crownover has financial stake in Devon. So now Nichols, the man behind Devon, is leading energy policy for Marco Rubio. 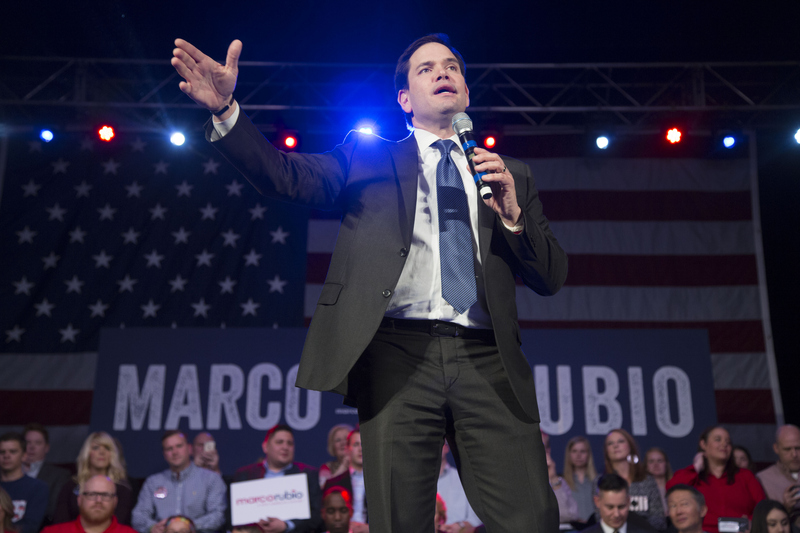 Let’s be frank: Rubio has very little chance of becoming the Republican presidential nominee. He may win the primary in his home state of Florida on ‘winner-takes-all’ Tuesday, but that’s not in the bag — and he’ll still be far behind Donald Trump and Ted Cruz. But Nichols’ role in his campaign is significant. It shows that 2012 was not just a one-off. In the last presidential election, Mitt Romney was advised by Harold Hamm, the head honcho at fracking firm Continental Resources. Nichols is cut from the same cloth. Essentially the Republican Party establishment has decided on its energy policy, and it’s fracking.